Perennial; caespitose. Rootstock evident. Culms rambling; 100-150 cm long; 1-2 mm diam. Culm-internodes distally glabrous, or pubescent. Culm-nodes glabrous, or pubescent. Lateral branches ample. Leaf-sheaths glabrous on surface, or pubescent; outer margin hairy. Leaf-sheath oral hairs ciliate. Ligule an eciliate membrane; 0.2-0.3 mm long. Collar pilose. Leaf-blade base cordate; asymmetrical. Leaf-blades ovate; 6-12 cm long; 7-18 mm wide. Leaf-blade surface glabrous, or pubescent. Inflorescence a panicle. Panicle open; elliptic; effuse; 10-28 cm long; 4-16 cm wide. Primary panicle branches ascending, or reflexed; 1-2 -nate; simple; 5-14 cm long. Panicle branches straight. Spikelets appressed; solitary. Fertile spikelets pedicelled. Spikelets comprising 1 basal sterile florets; 1 fertile florets; without rhachilla extension. Spikelets obovate; dorsally compressed; acute; 2-2.3 mm long; falling entire. 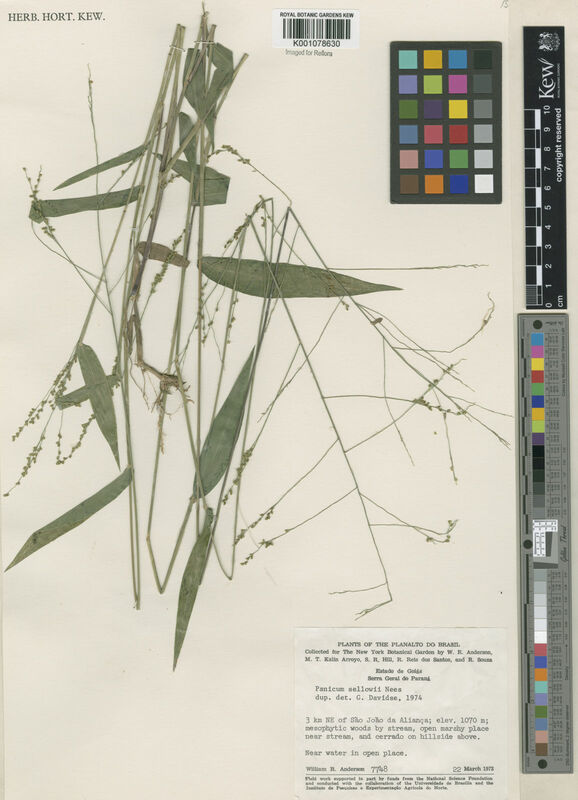 Glumes dissimilar; shorter than spikelet; thinner than fertile lemma. Lower glume ovate; 1.2-1.5 mm long; 0.66 length of spikelet; membranous; without keels; 1 -veined. Lower glume lateral veins absent. Lower glume surface pubescent. Lower glume apex acute. Upper glume ovate; 1.8-2 mm long; 0.9 length of spikelet; membranous; without keels; 5 -veined. Upper glume surface pubescent. Upper glume apex acute. Basal sterile florets barren; with palea. Lemma of lower sterile floret similar to upper glume; ovate; 1.9-2.2 mm long; 1 length of spikelet; membranous; 5 -veined; pubescent; acute. Fertile lemma ovate; dorsally compressed; 1.6-1.9 mm long; indurate; dark brown; without keel. Lemma surface rugulose. Lemma margins involute. Palea involute; indurate. Anthers 3; 1.1 mm long; purple. Caryopsis ellipsoid; 1.2 mm long. Nativa en Colombia; Alt. 0 - 2000 m.; Andes, Orinoquia, Sierra Nevada de Santa Marta, Valle del Magdalena. 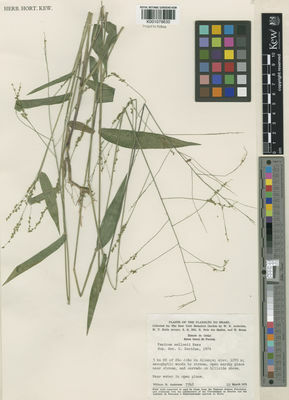 Panicum rugulosum var. condensatum Hack. 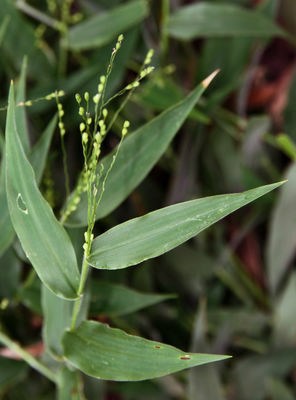 Panicum rugulosum var. hirtiglume Griseb.